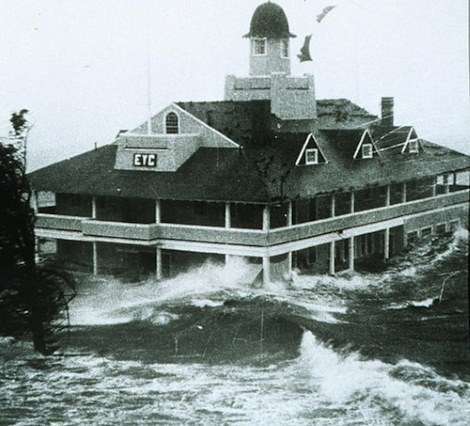 Hurricane Carol, one of the worst to hit New England, was so ferocious the National Oceanic and Atmospheric Administration retired the name for a decade after it struck in 1954. 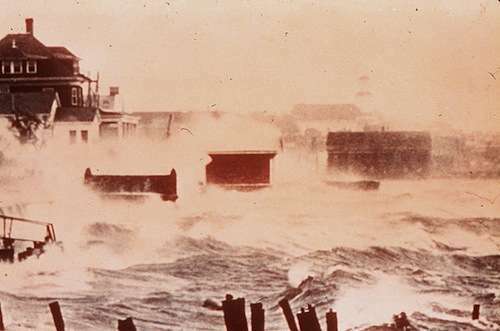 Strong, sustained winds swept through Rhode Island and the eastern parts of Massachusetts and Connecticut, killing dozens and destroying buildings, automobiles, boats and crops. The storm took out power for days, Gov. Dennis Roberts declared martial law in Rhode Island and called up the National Guard. Vermont, New Hampshire and Maine suffered as well, though to a lesser extent. In New England, 65 people died in the storm and a thousand were injured. Hurricane Carol started on Aug. 25, 1954, as a tropical wave near the Bahamas, and strengthened as it moved northwest. On August 27, meteorologists clocked Carol's winds at 105 mph. The hurricane then moved northeast, flooding the mid-Atlantic coast. On August 31, Carol sped up and slammed into Old Saybrook, Conn. The next day, Carol morphed into an extratropical cyclone over northern New England. Hurricane Carol crashes into Connecticut. NOAA photo. At the storm's height, winds gusted up to 125 mph, blowing roofs off houses in Rhode Island. The hurricane flooded downtown Providence with up to 12 feet of water. Winds on Block Island reached 135 mph, the highest ever recorded there. The aftermath of Hurricane Carol in Westerly, R.I. The storm washed away 200 homes in Westerly, R.I. In Newport, R.I., it damaged the Casino. Narragansett Bay, Buzzards Bay and New Bedford Harbor suffered storm surges of more than 14 feet. 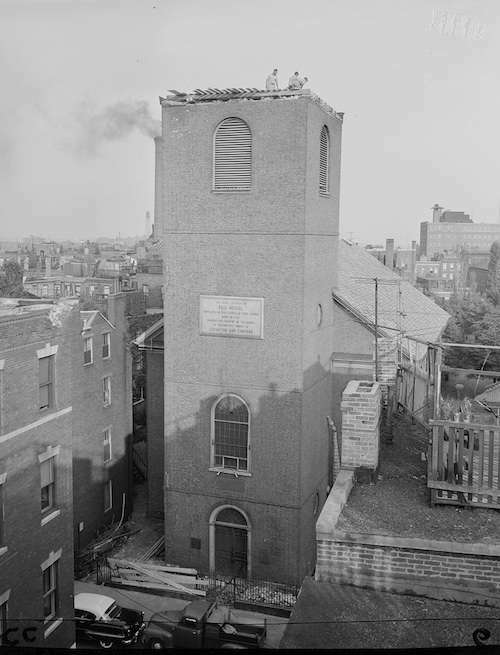 Old North Church after Hurricane Carol got done with its steeple. Photo courtesy Boston Public Library, Leslie Jones Collection. In Boston, Hurricane Carol tore off the spire of the Old North Church. Donations from children across America rebuilt it the next year. Digital Equipment Corp. then occupied the Assabet Mills in Maynard, Mass. The company’s employees filled several thousand sandbags to protect the buildings that housed production equipment. Hurricane Carol destroyed this boat in Marblehead Harbor. Photo courtesy Boston Public Library, Leslie Jones Collection. National Guardsmen flew a planeload of dry ice to Boston for people who lost power and had no refrigeration. Gov. Christian Herter called up guardsmen in six Massachusetts towns to prevent looting. 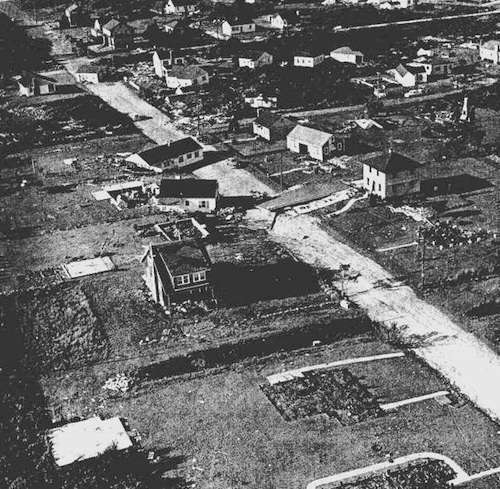 Cape Cod was evacuated, with 20,000 people leaving the peninsula. 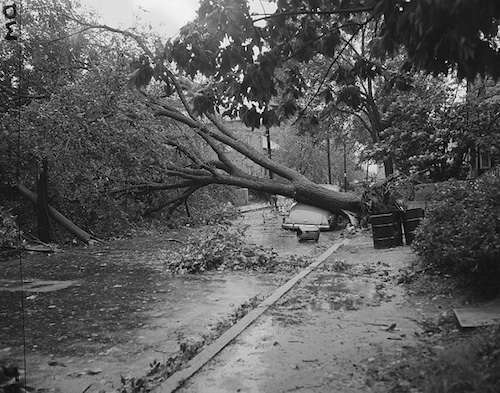 Damage from Hurricane Carol approximated $642 million, making it the costliest storm up to that point. The hurricane destroyed nearly 40 percent of fruit and vegetable crops -- apples, peaches, corn and tomatoes. A third of New Englanders lost power, many for days. Thousands of automobiles like this one were destroyed by Hurricane Carol. Photo courtesy Boston Public Library, Leslie Jones Collection. The storm damaged more than 10,000 homes, completely destroying 1,545. Another 3,000 boats and 3,500 automobiles were wrecked. Carol caused such destruction it was the first Atlantic hurricane name to be retired. It made a comeback 10 years later, only to be retired again. Then 12 days later came Hurricane Edna. This story was updated in 2018. You may also want to read about the Great New England storm of 1938 here. 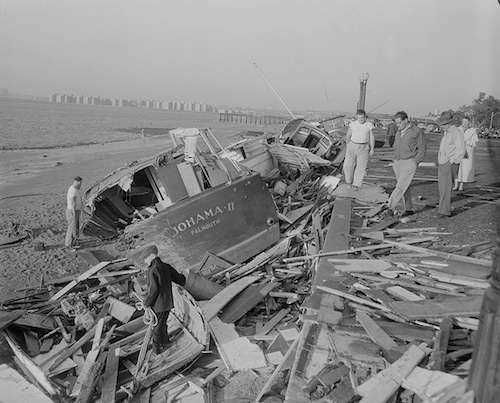 1954- I was 7 years old and still remember this storm. during Carol I was 13 in Providence Roger Williams Projects myself and 3 friends were had climbed a tree ro see better and the tree was blown done and I broke my right arm to this day I don’t know how I got to Rhode Island Hospital where they repaired it. Things were different then even during a hurricane kids went out and play, today kids don’t go out if there is a cloud the sky. I don’t know which is right. I was 6 and we lived right on Long Island Sound. I remember that night. Our basement was full of water to the first floor. We rowed around on the streets for about a week until the water receded. We kids thought that was great fun. The adults, not so much. My father bought us girls a two man saw so we could cut up a large Maple Tree that fell in our yard. I was also 7 and have vivid memories of Carol . I remember it well. Very exciting for a little girl. I was 8, in the Ansonia Derby Valley in CT. It was really destructive in Shelton as I recall….I remember standing on a bridge the day after, watching all sorts of stuff roaring by on the river below. and our Beetle Cat was at the bottom of a pile of ten boats on the beach at the yacht club. My grandfather took me to the beach to see everything that had washed up on the shore. Thinking I was about 6. I was a kid. My mother and I were on vacation in Ogunquit. We sat in front of a plate glass window to watch the hurricane. Dumb. After it was over, we walked down to the beach to see the damage. I believe there were some power lines down. Dumber. The year I was born. My mother told me about it. Didn’t know they retired her name. I was just a year old when this happened. I was 6 months away from conception when that came through. Glad I missed it. I think my grandmother lived in Old Saybrook, CT when she younger. Does she remember this? I also was 7 and living in Williamsport, PA. Those two hurricanes made for big storms in the middle of PA. A long time ago. 1954 I believe. I was almost 11 yrs old. My dad took us out after it was over. He actually helped people get out of a bus on Harris Ave that was stuck in a flood. My Mom’s cousin had a beach home that was off it’s foundation floating in the water! Then my cousin Norma got married the day of Hurricane Edna a much less severe storm. If rain is an indicator of good luck like Italians believe, it worked. They were married for over 50yrs before one passed. I didn’t know they retired “me”….. 2 years prior to my birth! 1954…my first memory.. Sitting on my moms lap watching out the windows. Dad worked for electric company so he wasn’t home.. Candles and all the food in the tub with ice. My parent’s seafood place was lost to Hueeicane Carol. My mom was pregnant for my sisiter and they never rebuilt. The foundation remains across from Flo’s Clam Shack…and my paren’s place was called the “Ocean View”. Wish I had a few pics..don’t know if any exist. I was 7 at the time. A big tree in our side fell and split our gym set in two. The upper branches were against my bedroom window, but luckily the window didn’t break. I remember the strange clouds, the howling wind and the lashing rain. My friends and I from Melrose, Ma were waitresses and off to college that fall. We worked at the Lookout Hotel (now condos) We served by candlelight. Our friend was a bell hop! I remember seeing the dirty boiling yellow waves as far as the horizon! My parents, brother & I were living one block south of the Sears on North Main Street behind the Olds dealership. During the storm my dad was driving cab. The house on Nashua Street is gone now as is the Sears. One of my early memories: Carol’s winds tore a huge elm out of t he ground and deposited it where the two roofs came together on my grandparents’ big colonial in Raynham, MA. Good thing my grandfather was a builder. He was working on it when Edna came through about ten days later… one of the few times I heard the old man cuss. I was 16 at the time Carol went through Boston.I lived in an area called Roxbury. I remember my brother and going out side after the winds and rain stopped. We went out and looked up and saw the blue skies and we’re happy that we could go out and play again but about how long I don’t remember the storm came again we didn’t realize that we were standing in the middle of the eye of hurricane Carol . Back in the day we didn’t know about an eye. Lots of destruction around the city I remember most the giant oak tree on our strent that went down. I was 22 and worked at Woods Hole. I also had a scholarship for studying there. I remember the boats turned over, piled on top of one another, wrecked on land. I remember houses down, flattened. I went to look over the edge of a hill to the harbor and was unabale to stand due to the high winds. There was a little field mouse there, hanging on for dear life. I picked it up na dput him in my shirt for safety. After I got back down the hill, I let him go. He ran off. My mother had called the Red Cross to see what they knew. There was no electricity and certinal ,no telephone service. Of course no cell phones then. The Red Cross told her that all was lost at Woods Hole. She thought I was dead I guess. I stayed several days to help with clean up. Then several of us piled in my old car and headed west back to the main land. When I got to a pay phone I called my mother. When she answered I heard a gasp and then nothing. Someone else came to the phone and told me they thought I was dead. I guess I have some pictures somewhere too. I always took pictures. But I remember it pretty well. But I do not remember where we stayed. Our dormitory must have been saved. The kitchen where I worked needed our help cleaning it up. I was 20 year old and working at the Marine Biological Laboatory in Woods Hole, MA when Carol came. Through, completely unannounced. We had had a beach party on Nobska Beach just under the Nobska Light the night before and were intrigued that the Coast Guard had run up the flags for a major storm when we were packing up. The next day was wild. Woods Hole was badly hit. I had been moonlighting at the Captain Kidd Bart and restaurant as a back up bartender (at age 20!) . The Kidd sits on (and slightly over) Eel pond to the north and west and Vinyard sound across the street beyond the Oceanographic Institute to the East. When the storm got going, and the water was 2/3 reds of the way up to the top of the bar, the village alchoholic left the bar and went to put on his bathing suit. We both decided it was time to leave- he to drink in a safer place and myself to offer some meager assistance to the boat owners whose boats were scattering on the roads and yards all over town. The principal bar tender at the Kidd owned an International 235 sailboat moored in Little Harbor and was coming ashore when wer arrived to check on it. We both went down to try and drag it up and over the railroad tracks Now the bike path) out of harms way when a call came from the crown on the bank to look behind ourselves and we barely escaped being crushed by a 35 – 40 ‘ boat that came Down on the one we were trying to save. Many of the Carol photos show the two boats in a tangle on the tracks at the NW end of the cove.and one that I just saw in 2017, 71 years ago.! S show me inspecting the damage the day after the storm. Investigators at the MBL paddled down the hall on the main building in canoes trying to salvage the research data they had accumulated that summer. It was an unforgettable event for a young college kid – and lots of others. Thinking a lot about Huiricane Carol after Hurticane/Tropical Storm Harvey devastated Jouston this week. I was days away from my 6th birthday and loving in Ware, MA when Hurricane Carol came through. A brook across a field from our house swelled to such an extent that we had to evacuate our house – a full basement and 6 inches of water on the first floor. Spent the night at my uncle’s house. Remember neighbors pumping water out of our basement through a window. It was exciting times for me as a children…not scarred by the experience. I guess it helped that the storm had my name. Returning to Providence for my junior year at Brown in early September found that the Crystal Tap at 3 Steeple Street was unable to serve tap beer for quite a while because the equipment had all been flooded.There were pumps running in downtown Providence well into October. 3 Steeple Street is a significant historic buildling, a fact I did not realize or appreciate at the time. I was 10 years old and in Oak Bluffs, Martha’s Vineyard. I’ll never forget it. My Mother was with me; but my Father was in Providence working. No communication with the mainland. Scary! The Oak Bluffs fire department had water up beyond the big door. TV Channel 4 antenna in Needham blew down during the storm putting the station off the air for several days after. Bad news! We had only 2 TV channels and that one carried Bob Brother Bob Emery! I was 9 at the time Carol came to town. It was exciting and a little scary. The following day we went to see the ocean, Kings beach, Swampscott. It was impressive but so was the damage. I was 5 and I remember being in my Mother’s arms looking out the window of the 2nd floor where we lived. I remember the wind blowing and the trees bending. Not far from us in downtown Providence there was massive flooding! I was 5 years old and what I remember clearest is my Dad (Edgar W. Grant) chasing our porch screens down Marion Ave. his jacket was flapping in the wind and he looked like a crazy man with the wind blowing him all over the street but he did catch those screens. The next day we all walked down the street to see the Edgewood Yacht Club and all the boats up on the shore. I walked out of Oakland Beach 7 years old with my Mother and Brother! Almost waist deep in water watching houses come apart trees blow down and people stuggling just to get up the street. To me it was a great adventure!!! Our family and house survived. I have a copy of the hurricane book published by the Providence Journal. down and lighting the wooden handle on fire. I will never forget that. My name is Carol and I was 14 and on vacation with my family when we got caught in hurricane Carol. I will never forget!! Early morning, radio only, no warning, more than a dozen families trapped on onset island, the sheer weight of 50 people in ur 2 story cottage held the house on its foundation. The men stayed downstairs, took the widows out of their frames to let the water waste high to go through the house. We could see and hear the funnel go right up buzzards bay. I was 10. After he water went down the men went out to try to find the baby that the mother lost hold of, the baby was found days later floating dead. I was at a family reunion in a little Compton, RI. We stayed at the Old Meeting House Inn which was owned by my Mother’s cousin, Amy Medary. Remember so many trees were down and power and phone wires dangling in the wind. The power lines sparking as they hit the wet ground. Leaves were stripped from trees and stuck to the Old Meeting House Inn sign in the front. I was 6 yrs old and we lived right on Long Island sound in Old Greenwich. The storm was terrifying. Our basement was full of water to the first floor level. However, the kids had great fun rowing around the streets in row boats for about a week until the water receded. The adults, not so much. I was 6 years old living on Belcher Avenue in Brockton, Ma. And remember the howling winds, losing electricity, seeing the roof of a garage next door blow off, our apple tree blown over and huge fallen trees up and down the street laying on downed power lines. I also recall large portable generators in the street to provide temporary power until the lines could be cleared from the many fallen trees. The sound of chain saws went on for some time. I am amazed that I still have such vivid memories of this powerful hurricane, but the windows in our house rattled and shook with the wind gusts. I believe this was hurricane Carol. I have no recall of Edna. I was 10 years old and I remember it well. We were at Cornfield Point Old Saybrook Connecticut three houses from the beach. My father took me out during the eye of the storm when all was quiet and the sun was shining. All of the roads were washed out and we were completely surrounded by water on the point . It was too late to evacuate . When the second part of the storm was about to start my father took me back to the cottage. He went back out and took movies of the waves coming over the houses on the beachfront. We spent the second part of the storm at our neighbor’s house roasting marshmallows in their fireplace. I was barely 4 months old and was staying with my mother at my grandmother’s little cottage in Dennisport on Cape Cod when Carol hit. Our cottage was just across the street from the ocean. There was an emergency evacuation of the area and my mom got me to higher ground and left me in the care of my grandmother so that she could stay on the truck and keep going back to assist in rescuing more folks. That was my mom, always keeping a cool head in a time of crisis and always reaching out to help others. A day or two later, there was a photo on the front page of the Cape Cod Times of my mom in the back of the truck, reaching out her hand to help someone get on board. I don’t remember any of it, but the story was passed on to me by my grandmother and my mother. I think I still have the newspaper in a file somewhere.